Complimentary Shuttle Bus Service will be provided during show days September 10 - 15, 2018, to and from the official show hotels and McCormick South and East Buildings. Shuttle schedule and pick-up points are subject to change. Be sure to check the official IMTS hotel lobby signs when you arrive in Chicago for current information and updates. Getting to McCormick Place is easy and convenient. There are three main parking lots on the McCormick Place campus. All are in close proximity and walking distance to the convention complex. Get directions and parking information on the McCormick Place website. 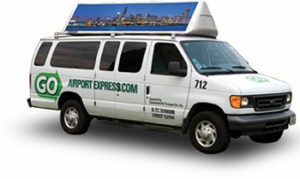 Go Airport Express is the premier airport shuttle provider for Chicago's O'Hare and Midway Airports and Convention Centers. They offer efficient and economical shared ride services, express luxury sedans and limo services as well as a complete line of charter vehicle services. Shuttles depart from O'Hare and Midway Airports every 10-15 minutes for Downtown Chicago and Suburban Chicago area Hotels. Click here to get 20% off airport shuttle rides today! McCormick Place is now connected to the Chicago Transit Authority (CTA) via both city bus and elevated train or “L” for elevated. The CTA Green Line stops at Cermak-McCormick Place. Located at the intersection of Cermak Road and State Street, just two blocks (0.15 mile) from the northwest corner of the McCormick Place West Building. Located on Level 2.5 of the Grand Concourse in the South Building, the METRA Electric commuter railroad provides direct service within seven minutes to and from downtown Chicago.